ARC provided by St. Martins Press, through NetGalley for an honest review. Started off a bit slow, and I was anxious for the author to get to the point. But once it did, it took of and was emotional and really HOT. Though Pandora Garret is a beautiful woman, she's sheltered by her mob boss father. Not because he loves her, but because he thinks of her as a commodity. A bargaining tool. When Pandora realizes that her father is about the give her to someone who can make his position stronger, she uses an opportunity of lapse in security to sneak away. With no money and no friends who aren't loyal to her father, she walks into a bar where she has an immediate chemistry with mogul, Jax Marrow. Neither knowing who the other is, they begin an affair that sets off an series of events where Jax feels the need to protect Pandora and get her away from her father's machinations. The moment they connected, the chemistry was HOT and Pandora liked it rough. The story was short and sweet. I wanted her safe and I knew he needed something in his life other than work. Because this was a short novel, the rough and (view spoiler)[why Jax was really uncomfortable (hide spoiler)] was not really explained. Also the beginning dragged a bit. There was this need for them to get moving and the reasons they didn't weren't really valid in my opinion. Also the family dynamics were a bit vague. I don't understand what was going on with Jax and his younger brother Donovan, which I guess is a good reason to read the next book int he series. It was definitely good enough to keep reading the series, but needed some editing and maybe a few more plausible situations. 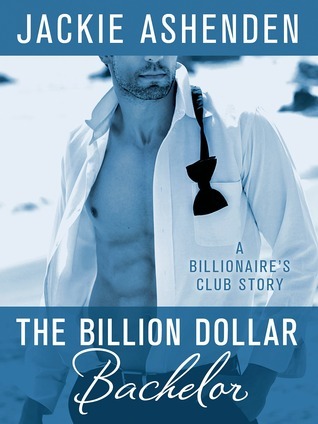 Sign into Goodreads to see if any of your friends have read The Billion Dollar Bachelor. 72.0% " "I like it, You always did an excellent Heathcilff impersonation. "\n \n "
Thank you LJ. I laughed when his brother called him Heathcliff. I'm a huge fan of that book, so it made me laugh. I don't like the slow starts - but I love the HOT ones! I agree. And it was short, so it didn't annoy me too badly. she just needed to get a move on quicker for me.